The Chinese violin on display in the Music Room area of the Institute of Texan Cultures is a huqin or “Hu-Chin” which is a general term given to any spiked fiddle. 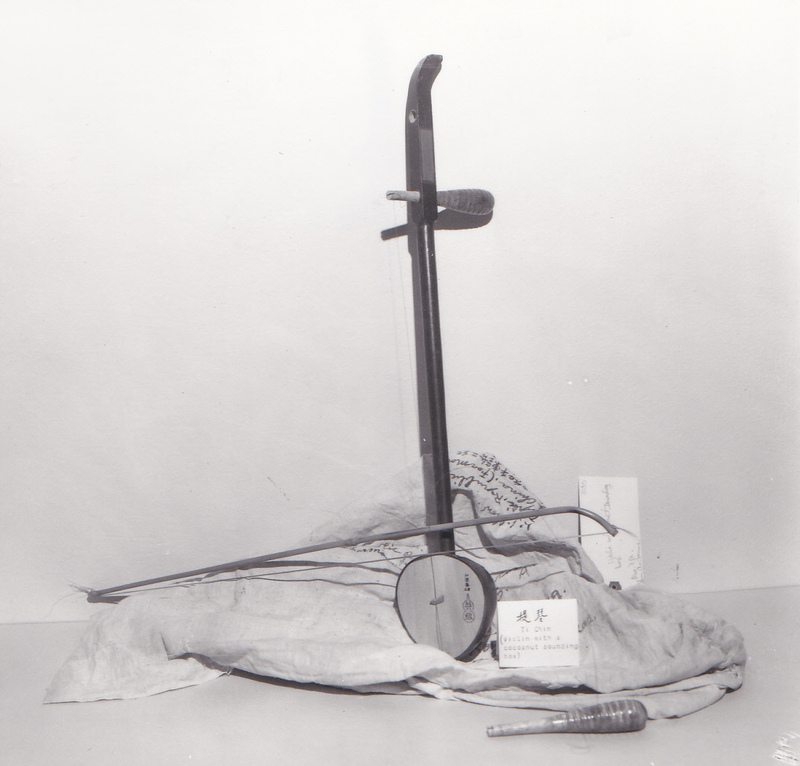 One type of huqin, called the “erhu,” is identified by its distinctive hexagonal sound box. Hugin are two-stringed instruments often made of rosewood, with gut strings and a horsehair bow. The strings on the violin can also be made of silk in stead of gut. The two pegs at the top of the violin adjust the tension of the strings and can be used to tune the instrument. The sound box of this hugin is made of a coconut shell and covered with a thin piece of wood to help produce the sound, other hugin may use an animal or snake skin to cover the sound box. When played it sounds melodic and ancient, which you would expect when looking at the violin. It has a long fret board but, unlike a traditional Western style violin, it is not played with the musician’s fingers pressing the strings against the board. Instead the musician uses their fingers to tighten the strings without pressing them against the fret board. The instrument is played vertically, while sitting on the lap of the violinist with the bow passing between the strings of the violin. This instrument is not easy to master and takes many years and discipline to learn. Guiding the bow through the strings and using the other hand to control vibrato and pitch is not easy. Because the strings float on top of the board; intonation is not easy to achieve. With lots of practice, the erhu can produce sounds that imitate birds chirping, horses neighing, and other calmer sounds. It is a very expressive instrument. Made from mostly natural materials it does require upkeep in order to maintain the instrument. If the sound box is covered in skin, every few years the membrane must be replaced because it will stretch out and lose its tension over the box. The horsehair on the bow must also be restrung because over time the hair will break or become loose. More modern types of bows have a screw to adjust the tension of the horsehair, so it can be left loose when the bow is not in use. This practice makes the hair of the bow last longer, so it doesn’t have to be replaced as often. Erhu players in a Chinese orchestra in Yishun Junior College. Image by Yishun Junior College Photos, via WikiMedia Commons. Qiang, Xi. Chinese Music and Musical Instrument. Clarendon, Vt: Tuttle, 2011. Sun, Jingfa. Variations for Erhu and Orchestra. 1990. Wong, Samuel Shengmiao, and Benedict Ming Jun Tan. Qi: an instrumental guide to the Chinese orchestra. Singapore: Teng, 2005.